» A GREGORY PECK Spy Thriller Review: NIGHT PEOPLE (1954). A GREGORY PECK Spy Thriller Review: NIGHT PEOPLE (1954). NIGHT PEOPLE. 20th Century Fox, 1954. Gregory Peck, Broderick Crawford, Anita Björk, Rita Gam, Walter Abel, Buddy Ebsen. Screenwriter-Director: Nunnally Johnson. The labyrinthine plot is a feature, not a bug. 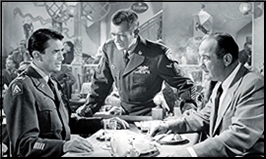 It’s the murkiness of the whole rotten deal that’s on display in Night People, a Twentieth-Century Fox production starring Gregory Peck and Broderick Crawford as two men attempting to navigate the return of a kidnapped American enlisted man in Cold War Berlin. Peck stars as Col. Van Dyke, a hard-nosed cynic who has learned that diplomacy means not only patience, but also making deals with the devil. Crawford is perfectly cast as Charles Leatherby, the kidnapped GI’s father. A car parts industrialist from Toledo, he believes that his fast-talking and his vast wealth will certainly expedite the release of his son. After all, money talks. His influence with elected officials back home is well known. But what starts off as a semi-straightforward case soon reveals itself to be a far more complicated and morally dubious scenario. It turns out that the communists want an elderly German couple, both known anti-Nazis in their day, as the price to pay. Initially, Leatherby is inclined to trade the couple if it means getting his boy back. He starts to get cold feet, however, when he ends up spending time in the hospital with the couple, both of whom chose to poison themselves rather than end up back in a Soviet prison. Things get even more shadowy when it comes out that the German woman isn’t German at all and that the GI’s captors may not be Soviets after all. [WARNING: Plot Alert] There’s one aspect to the film that continues to frustrate me, and that has to do with a character that presents herself to Van Dyke as a go-between who works both the American and Soviet sides. “Hoffy” Hoffmeir (Anita Björk) is an ex-lover of Van Dyke’s who says she’ll be able to set up the nighttime exchange between the two enemy forces staring each other down across Checkpoint Charlie. It’s a spy film whose main theme is deception, so it comes as no surprise that she too isn’t exactly honest about her true identity. But the way the screenplay is written, it’s never clear whether she’s been an imposter all the time or whether she’s been part of an elaborate plot to gain the confidence of Van Dyke from the very beginning. But perhaps that was the whole point. Maybe you can’t even trust a beautiful woman whose life you’ve spent hours researching. Maybe nobody anybody in Cold War Berlin was fully honest about their true identities, let alone what they may or may not have done during the Nazi regime. If Van Dyke is the hardnosed cynic, Leatherby represents the optimistic, can-do American whose illusions are shattered in the chilly Berlin night. It’s a surprisingly good spy drama about the moral equivalency of the city and the time, capturing both the tension of the situation and the complexity of life in not only a divided city, but an occupied one still haunted by past crimes. Buddy Ebsen deserves a nod too as one of those competent not entirely scrupulous sergeants beloved of military dramas from Van Johnson in COMMAND DECISION, to Bernard Lee in THE THIRD MAN, and Karl Malden in DIPLOMATIC COURIER. Jon pointed out how well Broderick Crawford was cast, but as you say, Buddy Ebsen was perfect in his role as well. In fact, of all the players in this movie, I can’t see any room for improvement in any of them. Two member of this distinguished cast worked with me, Max Showalter (Casey Adams) and Rita Gam, and both fine folks, though Rita tried too hard and that made life difficult for her and the others. Hard to believe the lovely woman had trouble with bits of business. She made it through, but it was a struggle.